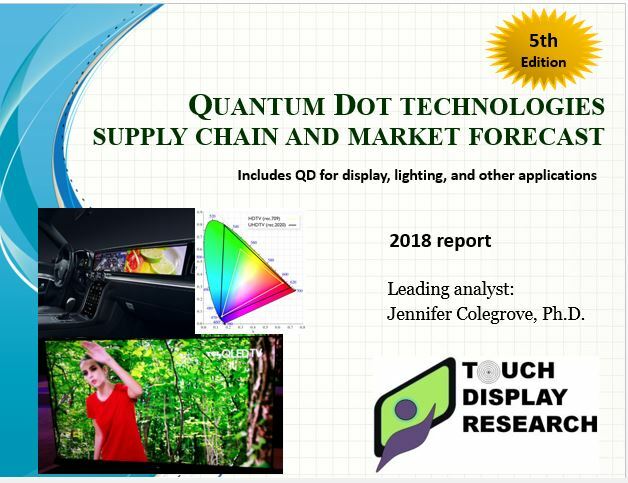 Quantum Dot Market 2018 Report - Touch Display Research, Inc.
Santa Clara, California, March 19, 2018—In the recently published “Quantum Dot Technologies and Market Forecast 2018 Report (5th Edition),” Touch Display Research surveyed many quantum dot suppliers, display manufacturers and OEMs, and analyzed and forecasted the quantum dot display component market with detail of material type and form factor. This report profiles over 110 companies working on quantum dot materials and quantum dot components. Touch Display Research forecasts the global quantum dot market will reach $16.6 billion by 2028. “The quantum dot industry changed dramatically in 2017. Samsung/Harman is expanding QLED to automotive application. Apple just entered quantum dot market. We forecast quantum dot industry will have rapid growth in the next several years,” said Dr. Jennifer Colegrove, author of the report, principal analyst of Touch Display Research Inc. Per clients’ request, quantum dot concentrate and pure quantum dot weight (kg) are calculated and forecasted in this 2018 report. Quantum dot display area (m2) are added in this 2018 report. Colegrove, author of this report, has conducted many first-hand interviews of quantum dot material and component suppliers, display manufactures, and OEMs in recent 10 years. She is the first analyst to publish a comprehensive quantum dot market report since 2013. Over 110 companies are profiled and supply chain analysis with many companies is provided. What does the new quantum dot ecosystem looks like in 2018 and 2019? Who will be the winner in 2018? Which form factor QD will be dominant in 2027? Besides display, what other market will QD flourish in the next several years? This report provides market analysis and forecast of quantum dot for display and lighting, with analysis of quantum dots for other applications: solar, battery, laser, bio-science, image sensor and medical labeling. This report provides not only the outlook for quantum dot components in display and lighting, but also analysis and comparison between conventional LCD, LCD with quantum dot, LCD with Cd-free QD, and AMOLED. The strengths and weaknesses of key players are analyzed. This report provides a Bill of Material (BOM) analysis of quantum dot displays for TV, and BOM of quantum dot monitor displays. This report include a PowerPoint file (>500 pages) and an Excel database. Market data in the report includes 5 years history data (2013-2017) and 11 years forecast data (from 2018 to 2028). The market forecast includes Unit, quantum dot component ASP and Revenue, with a detailed breakdown by Cadmium-type quantum dot and Cd-free quantum dot; a detailed breakdown by nine applications. The “Quantum Dot Technologies and Market Forecast 2018 Report” Fifth Edition is available immediately. Report sample, table of contents are available upon request.